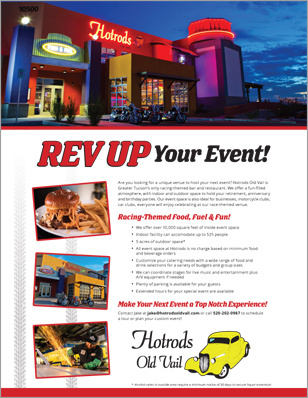 Host Your Next Event at Hotrods! Hotrods Old Vail is Greater Tucson’s only racing themed bar and restaurant! Hotrods’ unique fun-filled atmosphere is the perfect spot for your retirement, anniversary, and birthday parties. Our indoor and outdoor event spaces are ideal for businesses and groups. Motorcycle and car clubs enjoy our racing atmosphere – and so will you! Hotrods will make sure your event is a success and deliver a top notch experience. Contact us today via the form below or call us at 520-202-0987 to schedule a tour or plan your custom event!